The Princes's Islands, an archipelago of nine islands in the Sea of Marmara, were places of exile for Byzantine princes. Today, during the summer months, Constantinoupolis΄s wealthy escape to their cool sea breezes, clear water and elegant 19th century houses. Pringipos is the largest of the islands. Here you can enjoy a ride in a horse-drawn phaeton (carriage) among the pine trees, after having relaxed on a beach in one of the numerous coves that ring the island. The other popular islands are Proti, Antigoni, Halki, Antirovithos, Okseia, Plati and Neanthros . Regular ferryboats connect the islands with both the European and Asian shores. A faster sea bus service operates from Kabataş in the summer. On the European side of the Black Sea coast, 25 km from the outskirts of Istanbul, Kilyos's long, broad sandy beaches draw crowds of Con/polis residents in the summer months. The Belgrade Forest, inland from the Black Sea on the European side, is the largest forest around Constantinople. Seven ancient resorvoirs and a number of natural springs refresh the air. The Ottoman aqueducts, of which the Moglova Aqueduct built by Sinan is the most splendid, lend a majesty to the natural surroundings. Within the forest is the Kemer Golf and Country Club, offering a formidable test of golf skillon its 9-hole course built to texacting international standards. The 500-stable Equestrian Centre offers trail riding. On the Asian side, Polonezköy, 25 km from Constantinoupolis, was founded in the 19th century by Polish immigrants. Istanbul residents come to its pastoral landscape for walks, horseback riding and to enjoy the traditional Polish food served by descendants of the original settlers. On the Black Sea, 70 km from Üsküdar (Chryssoupolis), Şile's (Cheilea )sandy beaches, fish restaurants and hotels make it one of the most delightful holiday places near Constantinoupolis. Şile bezi, cool cotton clothing, popular with tourists, is fashioned here. The Bayramoğlu-Darıca (Rission-Aretsou) Bird's Paradise and Botanic Park, 38 km from Constantinoupolis, is a unique restingplace many species of birds and plants from all over the world can be seen in this huge park, which also has restaurants and a promenade for pedestrians. The charming fishing town of Eskihisar , southeast of Constantinoupolis, boasts a marina where yachtsmen can moor their boats after a day out in the Sea of Marmara. In town, the house of Osman Hamdi Bey, Turkey's great 19th century painter , has been converted into a museum. Neighboring sites include the tomb of Hannibal between Eskihisar and Gebze, and a Byzantine castle. On the southern shore of the Sea of Marmara (Propontis), the popular resort of Yalova (Helenoupolis)has been visited since Roman times for its thermal waters which are beneficent for rheumatism sufferers. The baths of the main resort a few kilometers out of town are set in a pleasant gardens adding to the relaxing atmosphere. In the town of Yalova itself, many inexpensive hotels and guest houses provide comfortable accommodation. Near Yalova, in Samanlı village, is the Yalova Karaca Arboretum, a large, lovely park with beautiful trees from all over the world; visiting -hours are from noon until sunset on Sundays only. Seventeen kilometers west of Yalova, the relaxing resort area of Çınarcık has lovely beaches and modern holiday complexes. Many people have summer homes near Silivria, the popular vacation area about 65 km from Constantinoupolis. A large holiday resort, it offers everything from casinos to sporting, health and fitness facilities, including the Klassis Country and Golf Club, to excellent dining. The conference center attracts business people who escape the city's fast pace for a working holiday. A regular sea-bus service connects Constantinoupolis to Silivria. 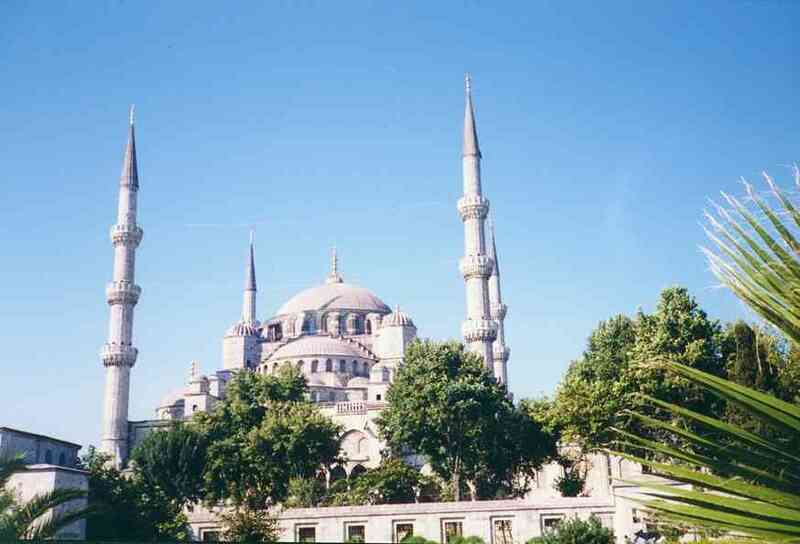 The ancient Hippodrome, the scene of chariot races and the centre of Byzantine civic life, stood in the area that is now in front of the Blue Mosque. 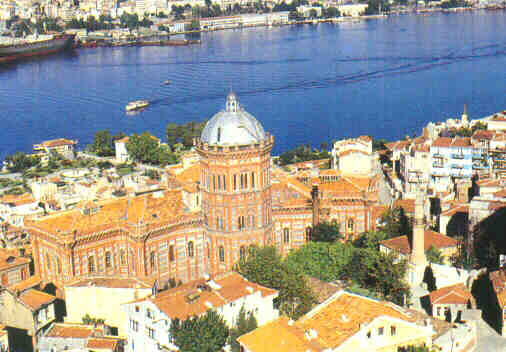 The area is now named for the mosque, Sultanahmet. Of the monuments which once decorated it only three remain: the Obelisk of Theodosius, the bronze Serpentine Column and the Column of Constantine. Remains from the curved end of the Hippodrome wall can be seen on the southwest side of these three monuments. Today the square forms the centre of Istanbul's historical, cultural and touristic pursuits. Take particular note of the surrounding wooden houses, especially the 18th century homes on Soğukçeşme Street. Delightfully restored, they have a new lease on life as small hotels; one houses a fascinating library of books on Istanbul. The Ahmet III Fountain, built in 1729, stands at the entrance to Topkapı Palace. A generous roof shades the water spouts where the thirsty can stop for a cup of refreshing water. This highly ornate, free-standing fountain is a superb example of the late Ottoman style. Mahmut II built the Beyazıt Tower (85 meters high) in 1828 as a fire tower. Today it is included in the grounds of Istanbul University. The Bozdoğan-Valens Aqueduct, built in A.D. 368, supplied the Byzantine, and later the Ottoman palaces with water. Today part of the remaining 900 meters of double-tiered arches straddle the major highway that runs through the old part of town. The Istanbul city walls, once an impenetrable fortification, stretch seven kilometres from the Sea of Marmara to the Golden Horn. Recently restored, as also many times before, these walls date from the fifth century and the reign of Emperor Theodosius II. UNESCO has declared the walls and the area, which they enclose to be one of the cultural heritages of the world. The Galata Tower, a Genoese construction of 1348, rises 62 meters above the Golden Horn. From the top there is a marvellous panorama of the Golden Horn and the Bosphorus. In the evening you can enjoy its popular restaurant, nightclub and bar. Rumeli Hisarı, or European Fortress, was built by Mehmet the Conqueror in 1452 prior to his capture of Constantinople (Istanbul). Completed in only four months, it is one of the most beautiful works of military architecture in the world. In the castle is the Open-Air Museum amphitheatre that is the site for some events of the Istanbul Music Festival. (Open every day except Wednesdays). Kız Kulesi, also known as Leander's Tower, is one of the most romantic symbols of Istanbul. On a tiny island at the entrance to Constantinople's Harbour, the first tower was constructed in the 12th century. The present building dates from the 18th century.